The expression “stop and smell the roses” is apt when describing the Skeyla. Too often we become caught up in our daily lives, and do not stop to acknowledge the fantastic things we have. 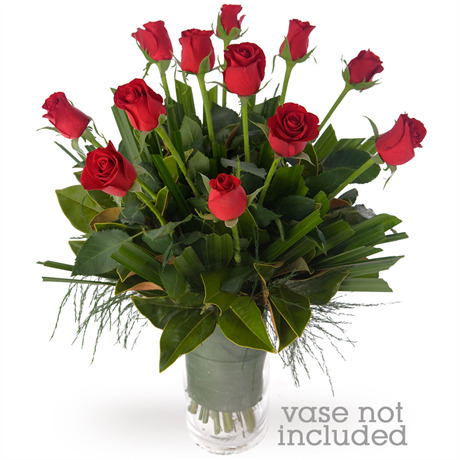 If you have someone special in your life, take the time to acknowledge them with this sumptuous display of twelve velvety roses in the hue of ruby red. A true representation of passion, this bouquet expresses your feelings in a way that words cannot, and is sure to make that special person in your life feel appreciated, cared for, and above all- loved. The Skeyla works best with a special additional gift like a bottle of champagne, a plush teddy bear or some delectable chocolates. As these flowers do not come in a vase, we suggest purchasing a large vase for ultimate impact. This surprise gift will bring joy and warmth into the day of someone important to you. Spoiling them is as simple as clicking ‘Next’ below.